It's always amazing the different poses cats can do, especially when they are resting or giving themselves a bath. Sometimes we think cats created many of the yoga poses people try to do because they are so limber. Did you know that a cat's spine can rotate more than most other animals? Their vertebrae have a special and flexible elastic cushioning on the discs. This extremely elastic cushioning allows cats to rotate their bodies as far as 180 degrees to the left and right. We've all seen those photos of cats (or seen our own cats) where their head and front legs are facing the opposite direction from the back legs and hips. Most humans can only rotate their torso 90 degrees either way. A cat's shoulders blades are attached to the rest of the body by muscles, which contribute to their flexibility. Mom Paula has noticed that Brulee loves to sleep on curves surfaces. She's had a curved scratcher since she was a kitten and it's one of her favorite places to sleep (except in Mom Paula's bed). Brulee also loves to sleep in the top of the cat tree with her head and front paws hanging over the sides or curled up into a little ball. 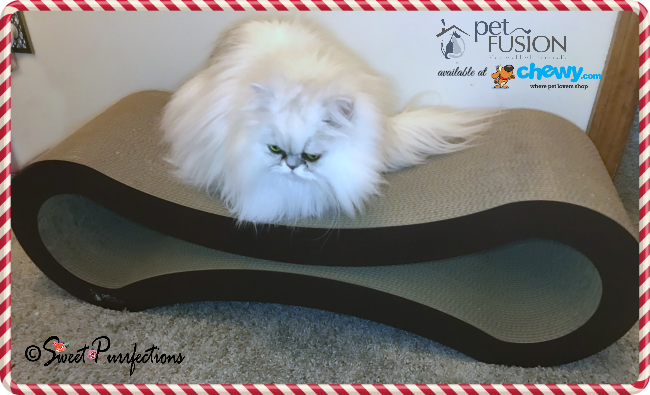 Most of the curved scratchers are covered in carpet that doesn't usually blend in with the furniture, so we were very excited that Chewy.com sponsored this post by providing us with the Pet Fusion™ Ultimate Cat Scratcher Lounge to try out. 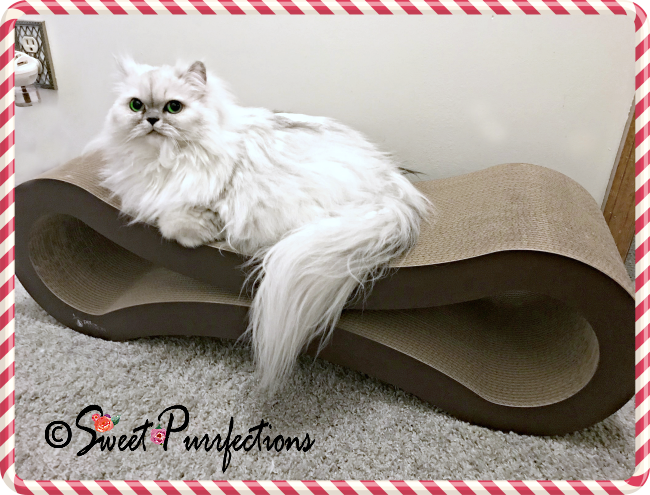 We've admired the Pet Fusion Ultimate Cat Scratcher Lounge in the past and wondered if it really was a beautiful and functional as it looked in the photographs. We're here to tell you that it's purrfect!!! Brulee claimed the Ultimate Cat Scratcher Lounge as soon as Mom Paula put it on the floor. You'll never believe how sturdy, large, functional, and comfortable this scratcher lounge is. It's available in slate gray and walnut brown. The dimensions are 34 x 10.5 x 10.5 inches and weighs 7.2 pounds. It's made of eco-friendly, recycled corrugated cardboard that required no assembly, so your human can take it straight from the box and put it in your favorite place to take a nap or lounge. It's both a scratcher and a lounge and can be reversed once one side is worn out to make it last twice as long. The curves are designed to assist with easier scratching and a more comfortable place to rest. The Pet Fusion Ultimate Cat Scratcher Lounge was featured on Animal Planets My Cat from Hell, received the 2015 Eco-Excellence Award, and recognized as a Top 19 Cat Products in the 2016 BuzzFeed viewer selection. 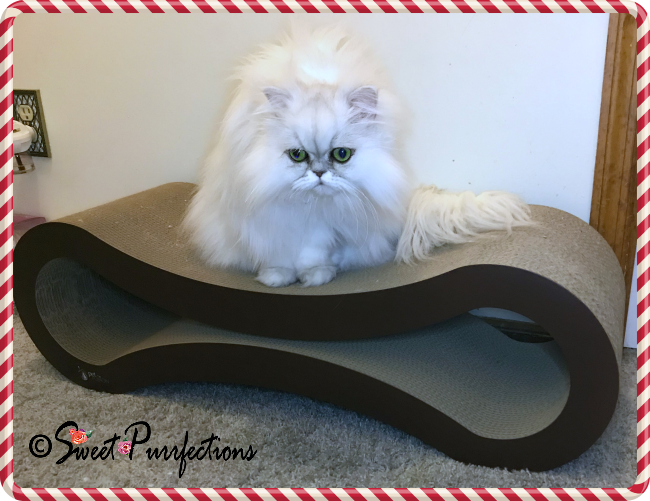 Truffle enjoys sleeping on the Pet Fusion™ Ultimate Cat Scratcher Lounge all the time and when she isn't in her cat den, she can usually be found lounging on the scratcher lounge. This scratcher lounge is both beautiful and functional and the important thing is that the girls love it. It's available at Chewy.com and qualifies for free 2-day shipping. 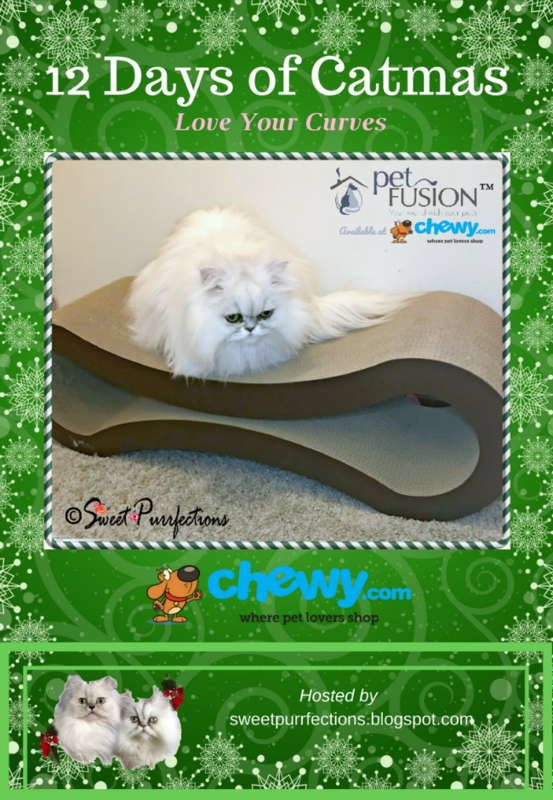 We're excited that Chewy.com has agreed to let one of our readers have the opportunity to win the Pet Fusion™ Ultimate Cat Scratcher Lounge. No purchase necessary. The giveaway is open to residents of the United States 18+ years, except where prohibited by law. The giveaway will run from December 5-12, 2017, ending at 11:59pm ET. One winner will be randomly selected by Rafflecopter (powered by Random.org) and notified via email. Winner will have 48 hours to claim her prize; failure to do so will result in forfeiture of the prize and a new winner will be randomly chosen. To qualify for the giveaway, a comment must be left on our blog post. Other entry options are available after a comment is left. Please check your email and be sure to add sweetpurrfections@sc.rr.com to your address book! Good luck! We have one of these, but it's quite old - we would love a new one! When my cat Jake is folded in half cleaning his (ahem) nether regions. When Minchie is on his back and his head and back feet are going in different directions! We would love to win this scratcher. Ham upside down lying on top of Ichiro's back snoozing. We've been wanting one of these since forever!! Oh, paws crossed we win! My Kotoha (who I found last summer as a two-week-old feral kitten and bottle fed until she could eat on her own) just LOVES her window seat. I swear, I don't know how she doesn't fall off it with the half upside down positions she takes, with half of her entire body hanging off the edge and paws in all different directions. It's fun to watch her. My baby Pudge sleeps with the back of her head touching her back. Also she sleeps with her eyes wide open! That is one amazing scratcher!!! That is a nice looking scratcher. Looks like it's got the seal of approval from both girls! Ellie loves scratchers - I'm sure she'd love this one too! my cat Loki likes to lay at the edge of something with her front legs dangling off straight down. Always has! I once caught my cat sleeping while sitting like a human LOL! We love ours as well! Sleeping on her back with her paws in the air. i dont have, but i have seen some very strange positions, where they are lying on their back, hanging over the chair. you would think they are dead or it hurt to be like that. i am entering to donate to safe haven for cats rescue. We have a scratcher like this and love it, but it's really looking ratty. We need a new one! We had one of those scratchers and my cats loved it until there was almost no way to scratch anymore. Then my husband sawed it in half and we made two scratchers out of it. We're on the last piece and we'd love a new one. My cats sleep in all kinds of crazy positions. I even wrote about it in a post about "competitive sleeping." Calvin's sleeping positions are awesome: I called one of Calvin's positions "Upside Down Quadruple Cute Paw with a Half Twist." He's a very flexible kitty. My cat was hanging off the couch and falling on top of my sleeping dog! My cat is pretty tame, no crazy positions! Oh my Cod! We need a new one of these for scratching and as a step for Isabella to get up on the bed! How awesome! Isabella sleeps with her head upside down. I don't really have any crazy positions but I do lay on my back showing my floofy belly sometimes. So many odd positions for my sweet babes, Think the cutest one is where my 1 cat fell asleep sitting up. BTW your kitties are gorgeous! Hmm. I'm not sure I've seen my cat sleeping in strange poses! She must be a very conservative cat! I would have to say while he is sleeping in a box, he just plumps in and goes to sleep any way he can fit. It has to be when he is laying beside the kids in the bed on his back! I've seen my cat laying on his side with one leg under a pillow and one over a pillow.